Our second Country Bloggers Meet was today and I had the most fabulous time catching up with such a wonderful group of ladies!!! We met at Anni Downs store " The Home Patch" Bathurst, then onto a lovely cafe Chai Wallah for lunch, afternoon tea and stitching. Deb (me) , Kate "Show and Tell" and Sandy "Sandys Patchwork Angel"
Thank you Chookyblue for organising yet again a fantastic day!!! Ladies travelled from Cobar, Orange, Campbelltown, Narromine, Conamble, Muswellbrook, OConnell, Dubbo, Mudgee, and Bathurst. 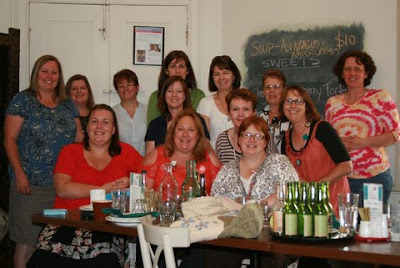 I cant wait to catch up with all of you again, hopefully at Nundle GDITC in March 2013. Was Such a great day !!!! Very content after a great day with great friends! Looks like a fabulous day was had by all. It's a shame that I live 10 hours away. So Glad you all got o have a catch up ...looked like a Great Day. So glad you have had such a wonderful day. Nice to put faces to names. Was so nice to meet everyone...how many sleeps till Nundle? Wasn't it the best day. So good to catch up with every one. Great photos. It was so nice to meet you, Deb! I had such a good day, it was brilliant...can't wait to do it again :) Suze. Sounds like a super fun day!